After a long day, some of us just want to relax and have a good drink with friends. It eases the stress we experienced for the day. It’s also our way of catching up with others and talking about anything such as politics, current events, and personal issues. We all know that the best stories are told over a few bottles of beer, right? The most common places for people to release stress are bars and lounges. With a wide selection of drinks at various prices, these places do not run out of customers. They’re always lively, especially at night-time on weekends when most people make time for meeting up with friends. 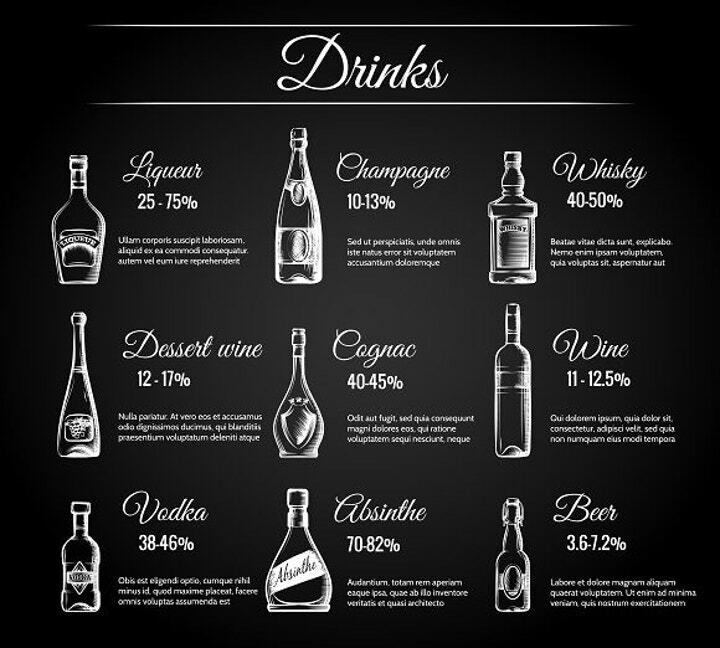 If you are a bar owner, you need to have an appealing menu to show to your customers aside from the drinks you offer. 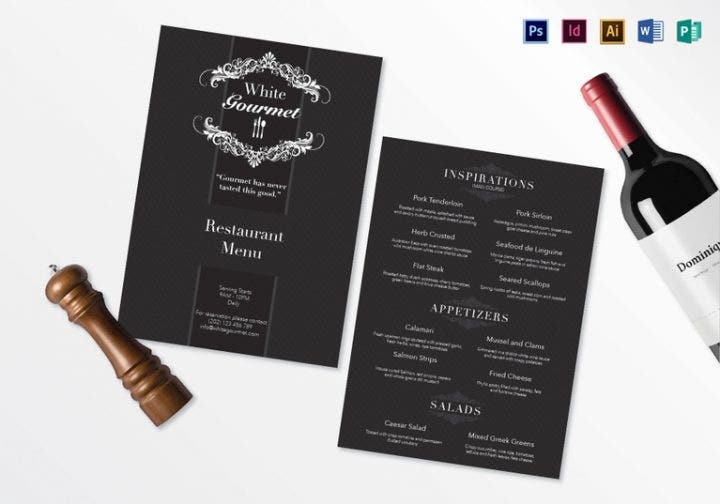 While black is the most commonly used color in designing menus, some colors can also be used. 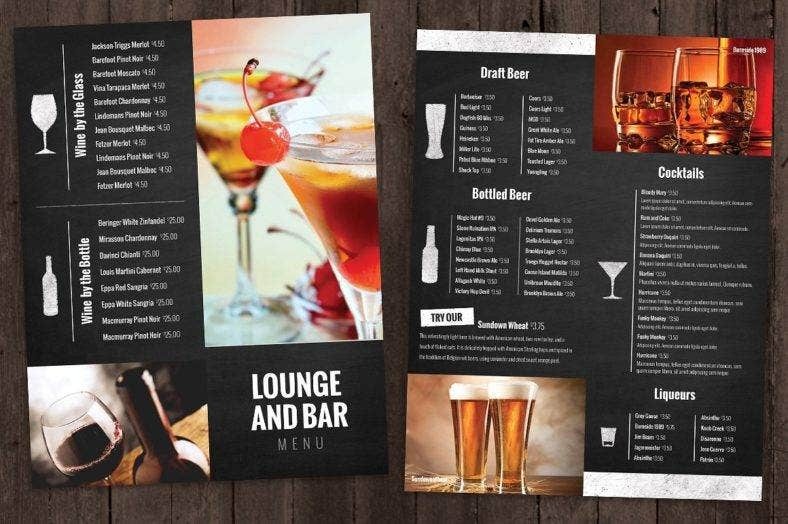 So here are some templates that can help you get started in choosing the perfect bar menu. A chalk typeface for a bar and lounge menu template is a good option. While black serves as the background, try throwing in some light colors for a cooler feel. A good example is the template shown above, which looks simple and clean with its chalk typeface. 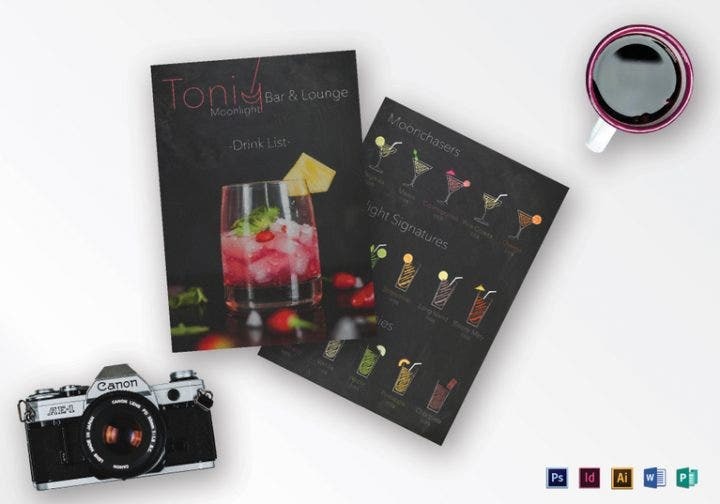 For the cover of the menu, you can take a photograph of a drink with ice and add some fruits to it. It’s available in Adobe Illustrator, InDesign, Microsoft Word, Photoshop, and Publisher formats at 8.27 by 11.69 inches. Light brown and black are also good colors for a template design. For this template, a neat arrangement of the menu would do. The fonts used are also clean-looking and simple. At 8.5 by 11 inches, the template comes in Adobe lllustrator, InDesign, Microsoft Word, Photoshop template, and Publisher formats. 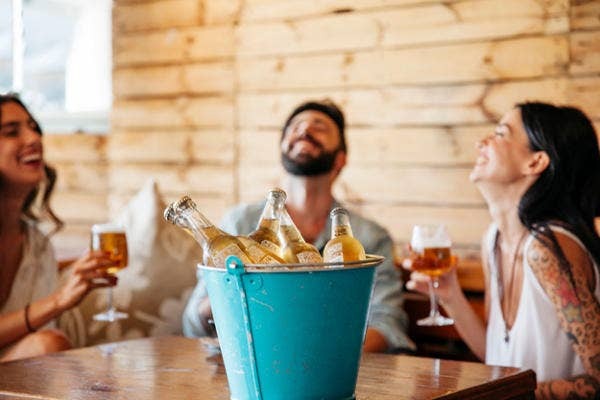 If you are a sporty person or you have been wanting to stray from the all-alcohol bar, this template is perfect for you. 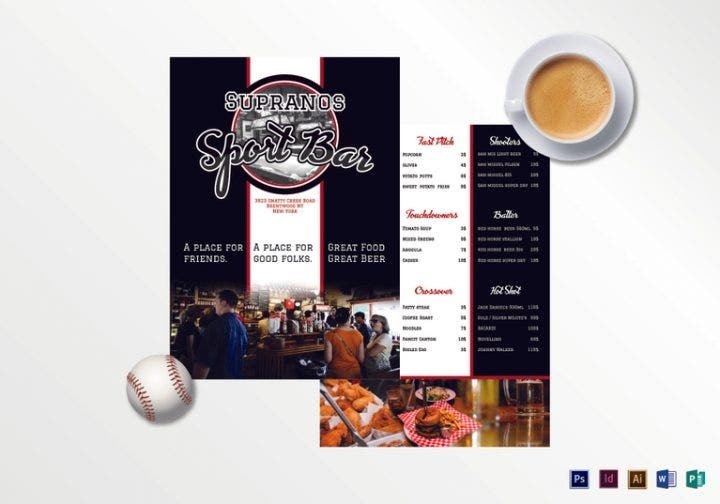 In this sports bar design, you can use white and red for your main accents. You can also add a lot of other design elements given the template’s size of 8.27 by 11.69 inches size. Available formats include Adobe Illustrator, InDesign, Microsoft Word, Photoshop, and Publisher. The pub, or public house, is where alcoholic drinks and light meals are sold. 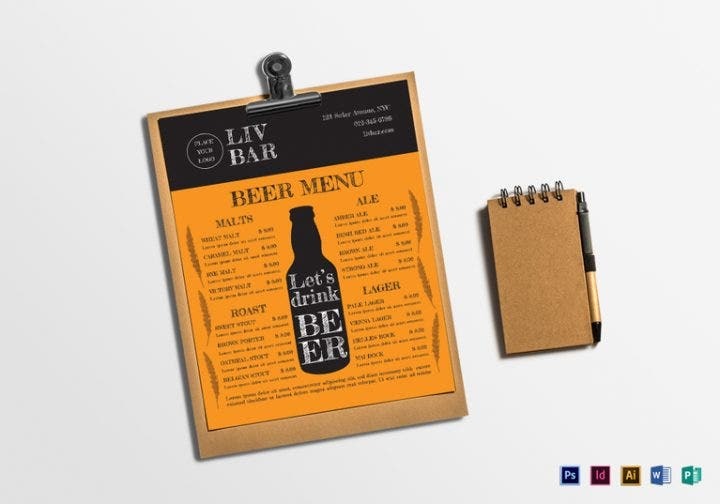 This template provides a separate menu for the meals and the drinks. As for the design, putting photos of the pub in the cool background would do. Photos of the meals and drinks you offer would also be good choices. 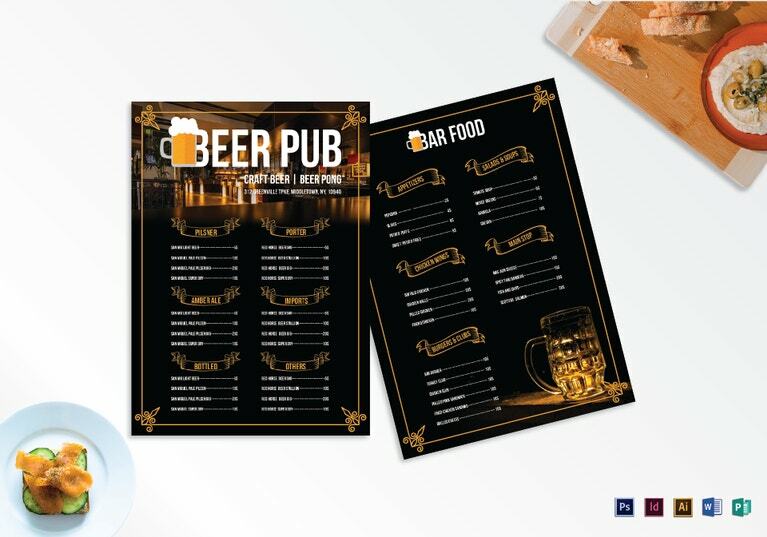 The Pub Menu Template comes in 8.5 by 11 inches and Adobe Illustrator, InDesign, Microsoft Word, Photoshop, and Publisher formats. This template is useful if you want to go for a folded type. The cover is plain while the insides contain text. At first look, it seems more of a brochure than a menu. This folded invitation note-like style saves space when you wish to leave the menus on the tables of your restaurant since it’s only 8 by 9 inches in size. Compatible formats include Adobe Illustrator, InDesign, Microsoft Word, Photoshop, and Publisher. With the use of a chalk typeface, this template depicts a hand-drawn pattern that’s been transformed into digital format. The price can be included with a short description of each drink. Colorful and flashy, this template works well if you only offer cocktail party drinks. You don’t have to put the price in order as long as it looks well. This is available in Adobe Illustrator, InDesign, Microsoft Word, Photoshop, and Publisher formats in a size of 8.27 by 11.69 inches. This template can be edited in Adobe Photoshop. 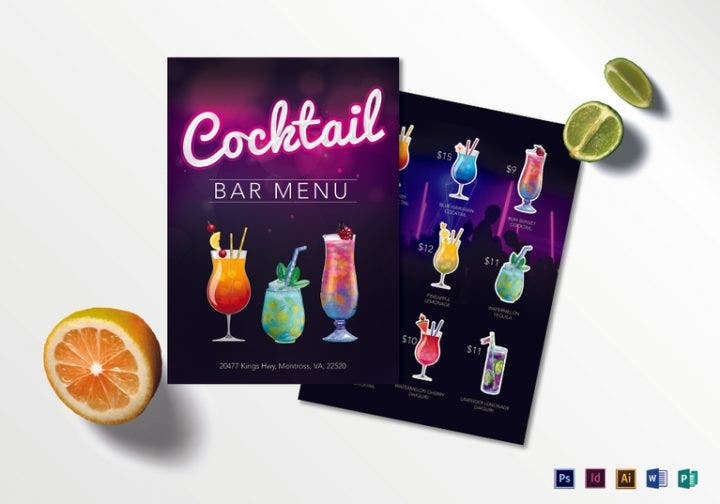 It has four sections where you can put eye-catching photos of the drinks you offer so it grabs the attention of customers. This is a menu styled as a brochure, so the three pages can be filled with text. 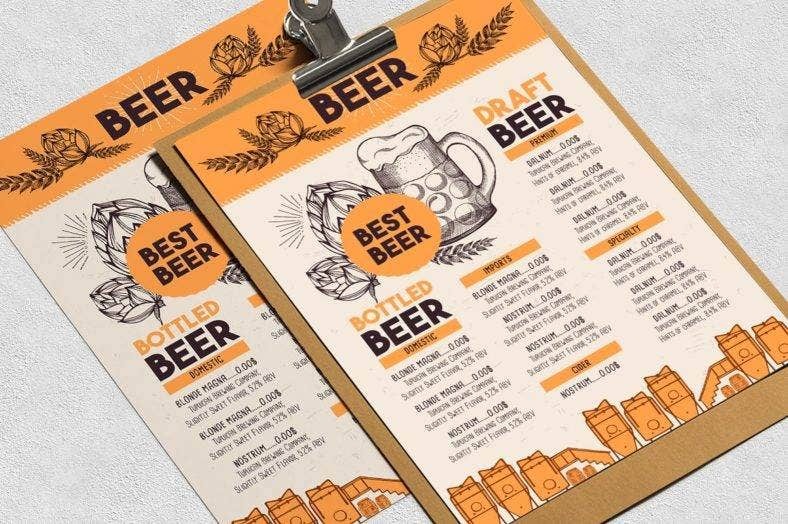 This beer menu template uses a combination of a chalk typeface and a strong shade of yellow. It’s minimalist and artsy at the same time. It relies on its free fonts rather than its graphics to create an impactful design. It’s available in Adobe Illustrator, InDesign, Microsoft Word, Photoshop, and Publisher formats at 8.5 by 11 inches. 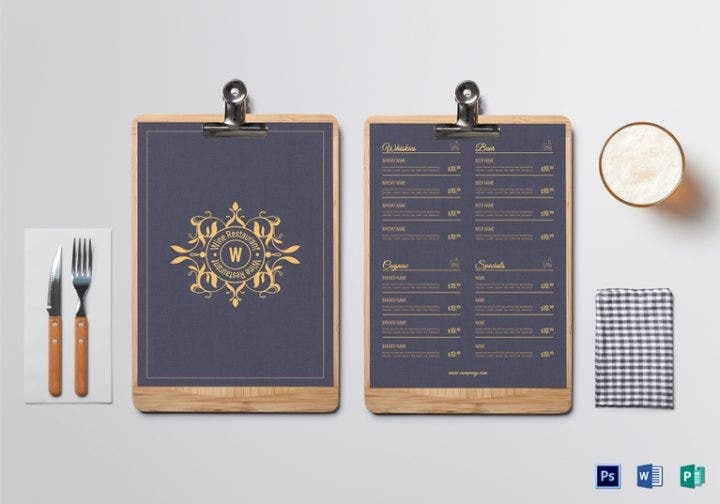 If you choose to be a little artistic with your menu, this template works well for you. The drawings and texts complement each other. Including a short description of every drink is a nice way to enlighten your customers on the drinks you have on offer. The black and white background goes well with the colorful illustrations. 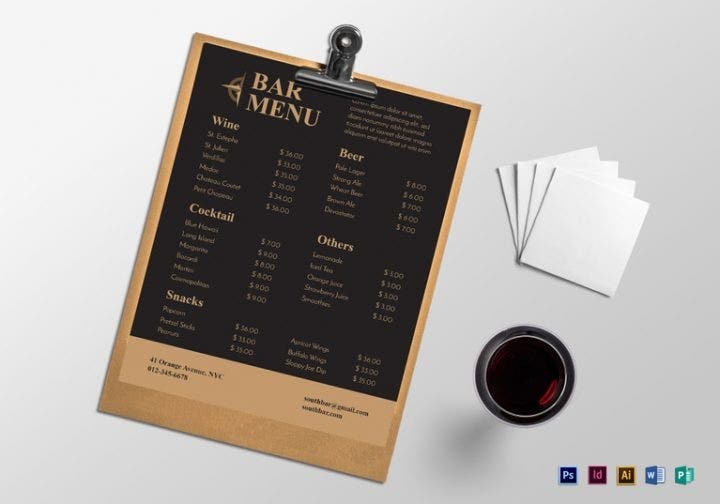 The black and white design of this template can be used for a bar menu template. Elegant and sleek, it just needs a little tweaking so you can customize it and make it your own. This is available in Adobe illustrator, InDesign, Microsoft Word, Photoshop, and Publisher formats at a size that measures 8.52 by 11.94 inches. 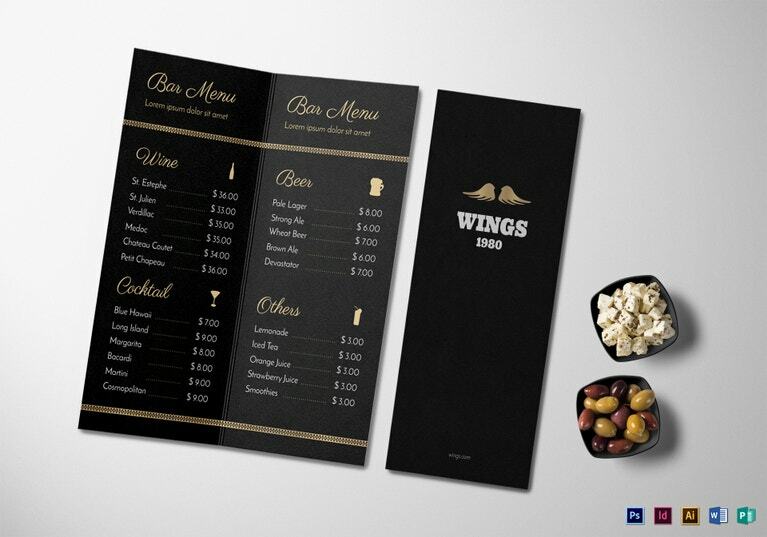 While this is originally styled as a flyer, this customizable template can also be used as a bar menu template. Yellow is usually used when designing beer menus such as this. It also has hand-drawn illustrations. If you plan on sending out opening invitations for people to visit your new bar, then you can use this template. Its classy and high-end feel will match the look of a luxurious bar. It’s available in a size of 8.2 by 11.69 inches with formats in Adobe Photoshop, Publisher, and Microsoft Word. 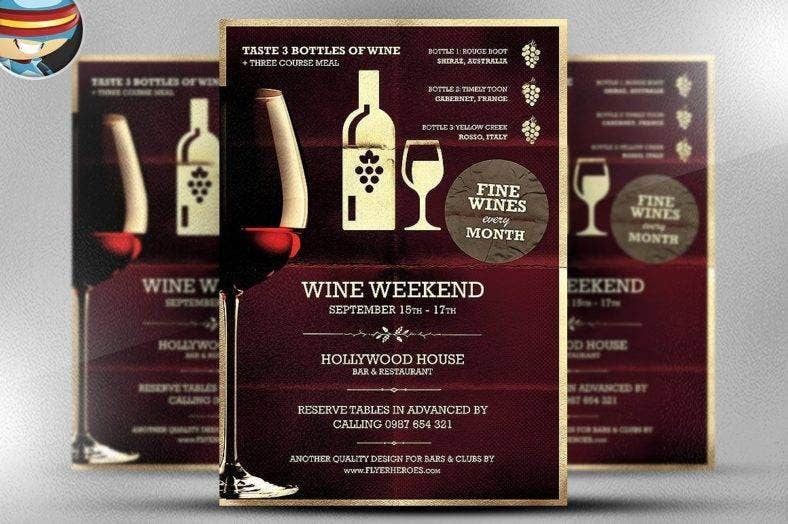 It has the looks of a poster but this template can also be used as a bar menu for wines. It uses the Rockwell and Brush Script fonts and is editable in Adobe Photoshop CS4. It’s also print-ready. 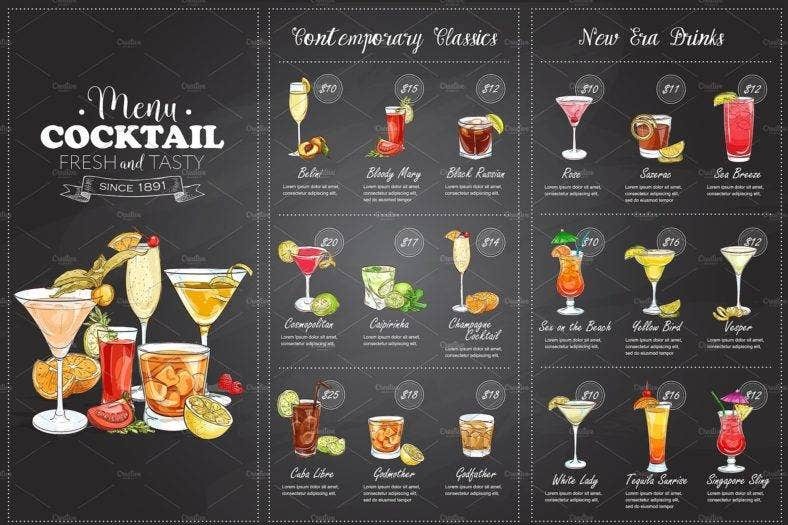 When designing a bar and lounge menu, always keep in mind that the design should be clean no matter how artsy it may also be. Aside from the prices, the design also makes an impression on the customers. There are even times that the menu design becomes eye candy for the people looking at it, so be sure to choose only the most attractive template designs for your use.